Dark 54.5% Cacao, Fair Trade, blend. 3-Drop fluidity. Repackaged. 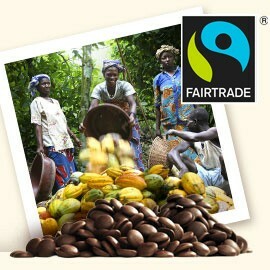 This fair trade chocolate is made with a somewhat thinner formulation than the C811NV callets above. Ideal for thin-shell dipping, molding, and enrobing. And you don't have to shave or break it into pieces because it's ready to use! Formula: Belgian 811NV, “Three-Drop”. Net wt 1kg / 2.2 lbs Repackaged by Oy, Chocolate!